Yesterday afternoon, the Eugene Backyard Farmer tweeted that they had two three-week old red sexlinks available. Somebody had decided they wanted a different breed and they brought these back for a trade. 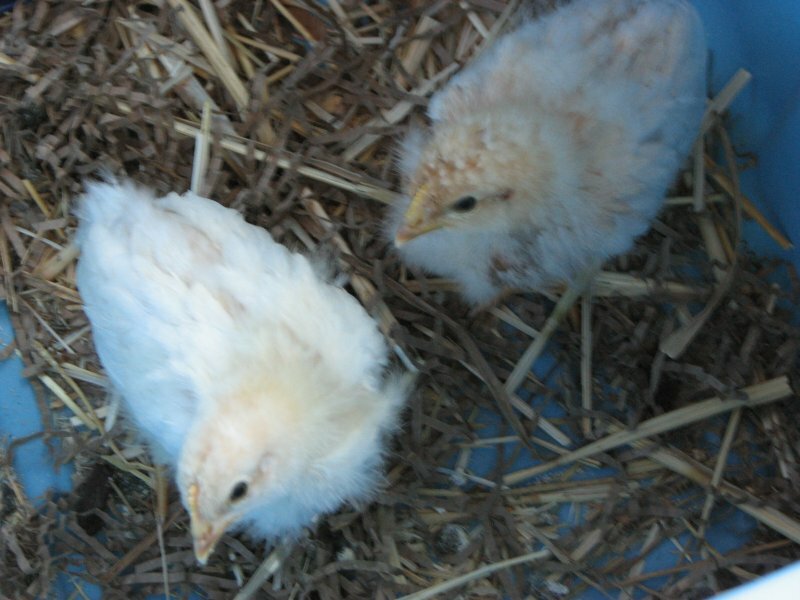 Half grown chicks, well past most of the tricky bits of raising babies, seemed like an ideal way to start chicken farming. They are past needing a heat lamp and only need about 4 more days inside before they can start spending daylight in their tractor. A week of that and then they're living in it full time. The tractor gets delivered tonight. Right now they're living in our bedroom, by the sliding door during the day and locked in our bathroom at night. Since they're layers, we can name them since they'll be with us for a couple of years. I've gotta admit they so far don't have qualities that would make me get emotionally attached to them like I do with fur creatures. That's a good thing since I'm already quite aware that I have no desire to run a chicken retirement home. For names, we're currently considering Sealey and Temperance or Sweets and Daisy (courtesy of the TV show "Bones") even though they're two girls. I also like Lily and Vivian in honor of the synchronized swimming star sisters from "Pushing Daisies". Lily's even a redhead in the show. On the fur creature front, here is the least blurry picture I could get of Marbles, our most troublesome foster kitten. He's been limping for two weeks now and Greenhill arranged to get x-rays for him this morning. Apparently, he's got femoral head necrosis. In layman's terms, the "ball" of his ball and socket hip joint on the right side is basically gone. 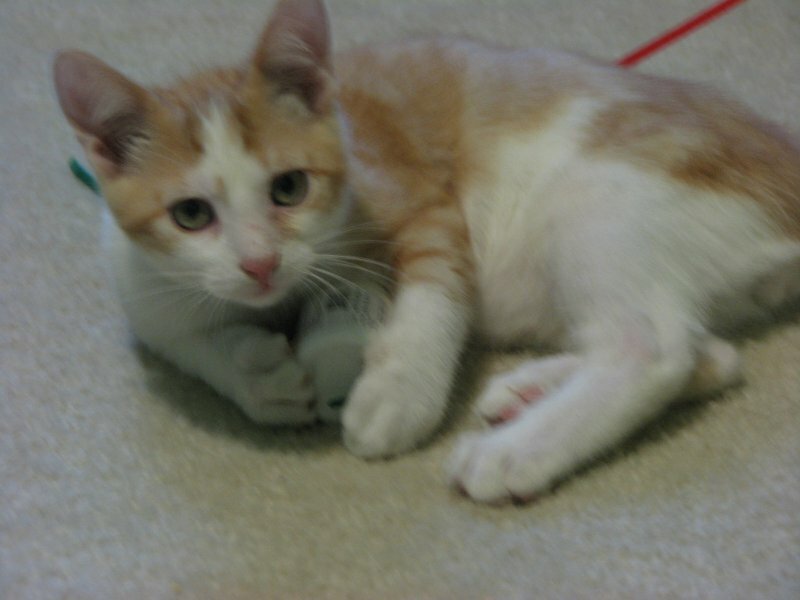 The vet says it's likely the result of an injury he received very early in kittenhood. My research into the disorder suggests it could have even been due to something that happened before birth. He doesn't seem to be in any pain - he just isn't able to use that leg, understandable since he effectively doesn't have a hip. That hasn't stopped him from becoming the heaviest of the three kittens though; he's almost 5 pounds now! All three are almost done with the ringworm treatments and the cultures will hopefully come back on Monday, clearing them for adoption after another two weeks of treatment just to be really, really sure. Ringworm is quite the persistent fungus. The vet is tentatively thinking Marbles' hip can be fixed with surgery but I'll get to know more on Monday when everybody goes in for their check-ups. I agree. Thankfully, he's not the one that will someday be stew.